Good morning Team Strykerites! Sorry for the mix up on posting dates this week. I totally forgot yesterday was Canada Day here so I was plenty busy celebrating my patriotism with poutine, good beers and even better company. One of my best buds came over and brought me one of the Call of Duty Mega Bloks sets and I’ve been losing sleep trying to build it ever since! They are amazingly detailed and complicated and designed for an older audience than standard Lego. I’ll post pictures once (and if) I finish building it. Doing the inks for this two page spread was scary as I wasn’t quite sure on the best method since this was my first ever two page spread. I decided to ink it as one whole piece instead of just ink each page and then graft them together digitally. I wanted to keep it consistent and this seemed like the safer route. The real hard part was piecing it together once it had been scanned in. No matter how perfect you scan it there is going to be some adjusting when putting it together afterwards. 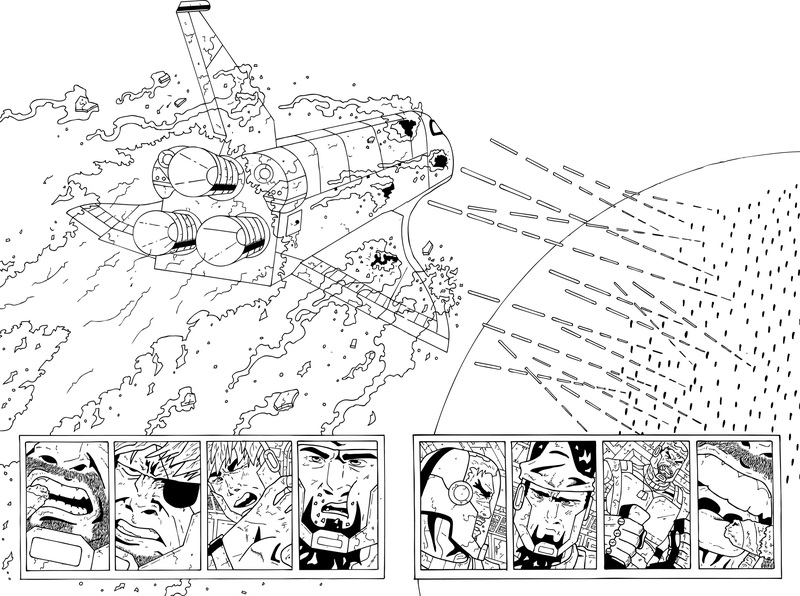 Check back tomorrow to see part 1 of the pencils to this explosive page!